If you’re always on the go and does not have time to make your own coffee or drop by some coffee shop, canned coffee or coffee in a can will be your best friend. From now on, you will never miss a day without the caffeine boost you need to jump start your day. Did you know that the first canned coffee is manufactured in Japan by the UCC Ueshima Coffee Co. in 1969. Now, everyone’s catching up to the trend, granted that we all live in a very fast-paced world with busy schedules. That’s why we compiled a list of the best canned coffee brands on the market. Rise Brewing Co. is the world’s first nitro coffee company. Their coffees are non-GMOs, organic, low in acid, and non-dairy. Well, to perfectly describe their coffee it’s super light and frothy. And to me, it’s like the perfect hybrid of stout beer and iced coffee. This canned coffee will also give you 1.5x more energy than any other coffee brands on the market. It’s also naturally sweet, no artificial flavorings, and it’s 70% less acidic than your usual can of coffee. LaColombe Coffee Roasters is a Philadelphia-based company founded in 1994. They offer a wide range of coffee types and flavors which you can choose from. The company has its chain of coffee shops in New York, Boston, Chicago, Washington, and Los Angeles. I haven’t tried any of their product except their canned coffee which is popularly known as ‘Draft Latte.’ My personal favorite will be their Mocha and Chai-flavored Draft Lattes. Heyday Cold Brew Coffee is a company who produces a wide range of canned coffee types and flavors. Heyday canned coffee only has 15 to 80 calories, and it also has 1 to 9 grams of sugar which is less than the average coffee in the can. Plus, it is organic and ethically sourced. This is really the ultimate guilt-free coffee, and I have yet to try their products. I’m keen on trying their Caramel-flavored coffee, because who doesn’t want caramel and coffee? High Brew Coffee is an all-natural cold brew coffee based in Austin, Texas. They might not have a wide range of coffee flavors, but they have the essential flavors. I’ve tried their Salted Caramel-flavored coffee and I must say that it’s really good. And, I am looking forward to trying Mexican Vanilla and their protein-packed Cappuccino. This list will not be complete without mentioning the ever famous Starbucks Co.’s coffee in the can. The company is one of the top leading and popular coffee chains in the world. Their canned coffee variants are pretty easy to find, they’re basically everywhere! My favorite go-to drink will probably the Starbucks Doubleshot® Espresso Salted Caramel Cream and the Starbucks® Doubleshot Protein Dark Chocolate. Monster does not only offer energy drinks these days. They expanded their to-go drinks and added triple-shot espresso into their line-up. Now that will wake your sense up and give you the extra buzz you needed for your hectic schedule. Personally, I haven’t tried espresso monster or any of their energy drink, and honestly, I really don’t know if I will since it might be way too strong for my liking. Cadence is one of the brands which I am very keen on trying since I head wonderful reviews about it. Their coffee lineup is inspired by the Ethiopian and South American way of brewing coffee, which is very interesting and intriguing. Cold Brew Coffee Co. is an organic coffee company which produces coffee products and merchandise. They were known for their organic canned coffee which is infused with nitrogen for the added boost. Caveman Coffee Co. produces one of the most popular Nitrogen infused coffee in the market. The company is known for their straightforward and bold image and their coffee has one of the largest coffee serving in canned coffee history with a whopping 22 oz. per can! Loco Coffee is one of my most favorite coffee brands ever, even if they only offer a limited range of flavors. Loco Coffee is a cold brew coffee with coconut water. Personally, I love drinking coconut water. This coffee does not have artificial flavorings, added sugar, preservatives, and most importantly it contains caffeine thanks to the coffee beans and electrolytes thanks to coconut water. Each can also contain 578 grams of potassium and 275 grams of caffeine which means that there will be no coffee jitters. So, if you are a busy, always-on-the-go type of person then, having to-go coffee in your fridge is an absolute must. You do not have to wait in line with random coffee shops, and you do not have to wait and make your own coffee. There are tons of flavors and types to choose from, and it always down to your preference. Do you find this article helpful? Comment down below your favorite canned coffee brand and flavor/s. Kombucha has been in the rage right now since a lot of people believe that it has tons of health benefits like improved digestion and it’s a go-to remedy for hypertension, headaches, hangover, fatigue, and even acne. This drink originated in ancient China for over 2,000 years ago. It is said to be a remedy for arthritis and other inflammatory ailments. And it is also believed to fight cancer. Surprisingly, this drink is fairly easy and inexpensive to make! All you need is tea, sugar, and active culture, and probably patience. Usually, people use back or green tea and add bacteria or yeast as their live culture and ferment it for 10 days. GT’s kombucha is hands-down the most recognizable kombucha brand and it is deemed as the mother of all kombuchas. Plus, this is the simplest and one of the most affordable kombucha drink in the game. It’s classic, simple, straight to the point drink which will make you say, “That’s definitely kombucha!” GT’s Kombucha is low in sugar, calorie, clean, and organic. If you’re keen to try Kombucha for the first time, I recommend that you try GT’s Kombucha – Orginal. If you’re looking for flavored, super food-infused or herb-infused Kombuchas then Health-Ade is the right brand for you! Not only do they taste delicious with its wide range of flavors which you can choose from, plus they are low in sugar, packed with vitamins and nutrients, and did I mention cute packaging? This is definitely my favorite kombucha brand and I recommend that you try Reishi – Chocolate, Maca – Berry, Pink Lady Apple, and Bubbly Rose. Humm Kombucha is one of the hippest kombucha brands on the game they have this unique take on your usual classic kombucha which is delicious, organic, energizing, and low in sugar. They offer ten kombucha flavors which you can choose from. My absolute favorite will definitely be the Blueberry Mint and Coconut Lime flavor. Kombucha Wonder by Wonder Drink is the first and only probiotic kombucha in the game. It is said to be low in sugar, organic, vegan, gluten-free, and it is also non-alcoholic. Everyone and anyone can enjoy this drink especially with it’s three yummy flavors: Apple Mint, Ginger Peach, and Tropical Mango. Bucha Live is one of the up and coming kombucha brands, and this brand has earned a huge following because of their organic and uniquely brewed light refreshing, low in sugar, and delicious fermented probiotic kombuchas and the classic brewed kombuchas. I highly recommend that you try their classic brewed Blood Orage kombucha and their Verbena Rose sparkling kombucha tea. Come to think of it coffee and kombucha is such an odd pairing but little did we know that they can somehow compliment each other! And, Hibiscus Ginger Grapefruit and Cranberry Ginger-flavored Reed’s Kombucha are my favorites, and you should really try it! Holy Kombucha is a company which prides themselves on manufacturing one of the best tasting and healthiest kombucha brands, but they are also doing socially responsible work for donating some of its earnings to charity. This is one of the main reason why Holy Kombucha is one of my favorite kombucha brands. Their kombuchas are made with organic sugar and tea and it is also infused with fruits which gives their drink an added delicious taste and nutrients. I love their Berry Passion, Blood Orange, and Sangria-flavored kombucha teas. And you must definitely try it! Bao Kombucha is one of the best-tasting kombuchas which I have ever tasted. It’s rather iconic and unorthodox take on their packaging makes their brand stand out from others. They offer a variety of flavored drink and Roots Beer is my favorite. There are tons of drink which you can choose from, but not all of them are as healthy. Kombucha may not be the most pleasant smelling drink in the market but it is sure worth to try! It’s delicious and it is packed with vitamins and nutrients! Hence, why we compiled a list of the best canned coffee brands on the market. Caveman Coffee Co. produces the one of the most popular Nitrogen infused coffee in the market. The company is known for their straightforward and bold image and their coffee has one of the largest coffee serving in canned coffee history with a whopping 22 oz. per can! If you are a busy, always-on-the-go type of person then, having to-go coffee in your fridge is an absolute must. You do not have to wait in line with random coffee shops, and you do not have to wait and make your own coffee. If you are, like me who loves tea but has an okay relationship with coffee, then you’re in for a treat! There are tons of tea brand out there that we tea lovers have yet to explore. Tea is a wholesome warm or cold drink which is full of nutrients and enzymes which are beneficial for our health. And, this is one of the reasons why I love them. But, did you know that teas also contain caffeine? They do, which is why I highly recommend that you try drinking tea in the morning rather than just coffee. It gives you energy to kick-start your day without the jitters. Which is why we created a list of the best tea on the market. Sit back, relax, and grab your drink or snacks, and let’s get on this tea. Tetley Tea Brand is the world’s second largest tea manufacturing company. They are also the largest tea distributor in the United Kingdom. They offer a wide variety of tea types and flavors. Tetley offers one of the best black tea, and they also offer tea blends which are also very fun to try. But, whenever I need a stronger boost my go-to drink will probably be the Tetley Extra Strong Tea. Whenever I drink it it’s as if I drank a double-shot espresso without the jitters. And, did I mention that it’s extra-tasty too? Twinings is one of the oldest established tea company in the world. It was first found in 1706 by Thomas Twining at No. 216 Strand, London, United Kingdom. The famous Twinings’ logo is the world’s oldest continually-used company logo. They offer numerous tea flavors which are perfect for tea lovers, like me, explore different types of tea. Personally, I love their spicy chai tea and their earl grey tea. I remember way back in high school I will always drink a cup of their earl grey tea while studying. Harney & Sons Tea is an American Tea company based in Millerton New York. It is famous for its whimsical yet simple packaging. I remember receiving their Birthday Tea on the day of my birthday, which was given by my best friend. And it has been a tradition of my Best Friend and me to drink this tea on both of our birthdays. They also offer tons of classic flavors and holiday blends which are equally delicious and revitalizing. 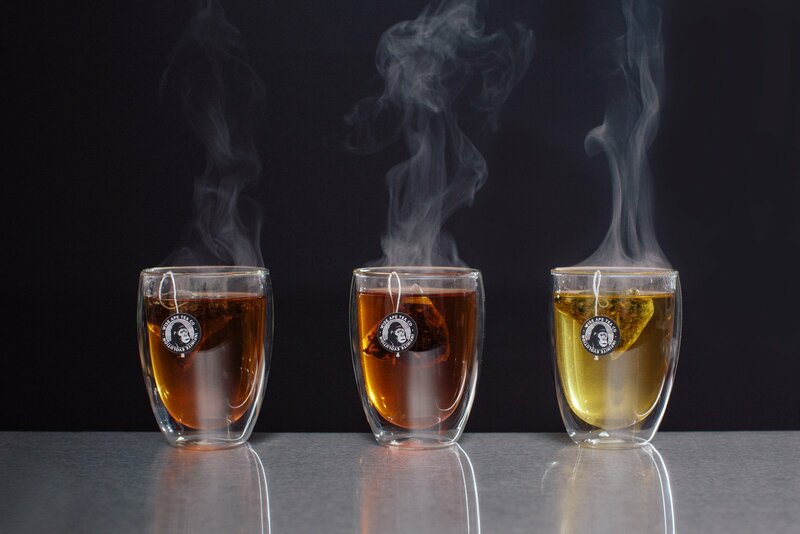 Are you looking to try different kinds of tea blends? Well, The Tea Republic is the perfect tea brand for you. They offer different types of tea, flavored tea, and iced tea. I highly recommend their Organic Goji Berry Green Superfruit Tea, Organic Pomegranate Green Superfruit Tea, Peppermint Cuppa Chocolate Tea, and Ginger Peach Chocolate Truffle Black Tea. They are my absolute favorites. It is also worth mentioning their Pumpkin Spice Black Tea since it’s fall and we’re on this pumpkin-everything bandwagon. And, this is my top favorite tea brand. Numi Organic Tea is a company which is based in Oakland, California. They are known for their fair trade certified and organic teas and herbal teasans. They offer a wide range of organic tea assortments and herbal drinks which are beneficial for our overall well-being. And you must definitely try their ceremonial matcha tea. It’s really good, and it’s also a great energy booster. Pukka is a herbal tea and supplement company which is based in the United Kingdom. They offer a wide range of herbal tea options which are specifically aimed towards relaxation, energy boost, cleansing, immunity, digestif, and women’s health. It’s refreshing to see herbal products which are geared towards women’s health. Which is really awesome! This is definitely my second favorite tea brand of them all, not only because of it’s cute packaging but with it yummy fruity and sweet flavors which you can enjoy every day. Usually, I start off my day with their English Breakfast Tea to jump start my usually lazy mornings. Then by afternoon, I drink their Peppermint Tea which really helps my digestion. And, by evening when I crave for something sweet I drink the Super Berries Tea or the Chocolate Super Berry Burst tea. And, if I’m having difficulties sleeping, I drink their Chamomile Tea. I am an ‘English Tea Shop’ girl since 2012. Kusmi Tea is a Parisian tea company which was found in 1876. Kusmi is known for their variety of sweet tea blends which are equally delicious and revitalizing. This French company primarily sells Russian tea since its founding by a man named Pavel Kousmichoff who hails from St. Petersburg, Russia. Yogi Tea is an international tea brand which is known for their black, chamomile and their detox tea. The company prides themselves on having quality ingredients in every cup. In all honesty, I haven’t tried this tea brand yet, and it is definitely in my grocery checklist for this coming week. Good Earth Tea is an American company which is known for their premium artisanal tea and tea blends. They offer tea which will tickle your taste buds while revitalizing your senses. They’re known for their exotics tea blends which give you an instant pep in your step, even at the laziest of all mornings. And, I strongly recommend that you try their Sweet Rose Chai if you’re feeling sophisticated, and this is really my go-to tea for my stay-at-home brunch party with my friends. And you can either serve it hot or cold, depends on your mood and weather of course. But, if you miss your tropical island getaway then I recommend trying the Mango Chili Bang Bang Tea. It’s like Hawaii and Bora-Bora in a glass. It’s better if you serve it cold. Whether you love tea or not, it’s really worth trying. Tea isn’t a boring beverage if you ask me. In my opinion, tea is like the vodka of healthy people, since you can pair it with just about everything. If you’re still not convinced, then you are truly missing out. One of the coolest brands in the tea market is headquartered out of South Jersey. Wise Ape Tea brings a unique perspective to the tea world. They note only brew some of the highest quality tea on the market, they are also philanthropic. With a certain percentage of each sale, goes directly back a non profit. They currently have three teas on the marketing; Chocolate Hustle, Coconut Warrior, and Orange Dreamsicle. Each carefully crafted and tested in their lab. What I love about Wise Ape Tea the most is their passion for tea. It’s not just tea to co-founder Joe Scola and his team. It’s a way of life. Copyright © 2018 Bad Vegans INC.